Other supplements quit working when Oraescin ® has just begun. That’s why Oraescin ® is a true powerhouse for vascular support. 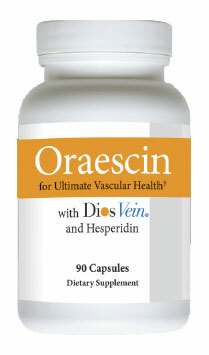 It’s why Oraescin ® is so effective at supporting veins and promoting healthy legs. And it's why people can’t stop raving about their results! DiosVein® is the purest, highest quality form of diosmin. Manufactured in Spain, DiosVein® is the brand of choice for thousands of European doctors and hospitals. They’ve used it for decades to successfully treat patients with discomforting and unsightly veins. And they continue to do so today. Our doctors and formulators were so impressed with DiosVein®, we made it an integral part of Oraescin ®. You get a whopping 900 mg of in each daily dose! And that's just the first powerhouse ingredient. Along with DiosVein®, Oraescin ® contains three more of nature’s best remedies including hesperidin, horse chestnut, and Vitamin C. Like diosmin, clinical studies show they too have potent protective and restorative properties. Best of all, Oraescin ® is 100% RISK-FREE, backed by our 60-Day Guarantee of Satisfaction. So you really do have nothing to lose. 5 MJ Martinez-Zapata, et al. Phlebotonics for venous insufficiency. Cochrane Database of Systematic Reviews 2016, Issue 4. Art. No. : CD003229. DOI: 10.1002/14651858.CD003229.pub3.